Professor Ito is one of the most distinguished probability theorists in the world, and in this modern, concise introduction to the subject he explains basic probabilistic concepts rigorously and yet gives at the same time an intuitive understanding of random phenomena. In the first chapter he considers finite situations, but from an advanced standpoint that enables the transition to greater generality to be achieved more easily. 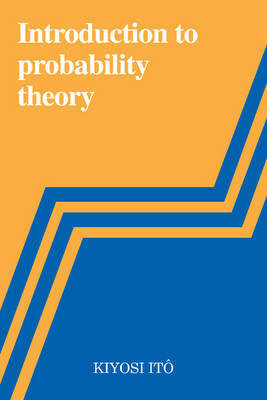 Chapter 2 deals with probability measures and includes a discussion of the fundamental concepts of probability theory. These concepts are formulated abstractly but without sacrificing intuition. The last chapter is devoted to infinite sums of independent real random variables. Each chapter is divided into sections that end with a set of problems with hints for solution. This textbook will be particularly valuable to students of mathematics taking courses in probability theory who need a modern introduction to the subject that yet does not allow overemphasis on abstractness to cloud the issues involved.